This post is part of our Global Voices’ Special Coverage Ukraine's #Euromaidan Protests. On the 57th day of Ukraine's massive pro-European, anti-government protests, the country's parliament passed a law that limits freedom of assembly, restricts the country's media and clamps down on freedom of expression. Law No. 3879 [uk] introduces a variety of legal changes “for protecting the security of citizens.” Members passed the legislation during the parliament's first session of the new year on January 16, 2014. The law comes as thousands of protesters continue to fill a central square in Kiev. The Euromaidan protests, as they have been dubbed, began as peaceful pro-EU rallies but turned into a large-scale anti-government movement after police unleashed an aggressive crackdown against demonstrators – a handful of brutal beatings by police have been captured on film. A draft law “passed” in full by the ruling majority in parliament on Jan 16 criminalizes libel, labels and restricts civic associations receiving foreign grants as “foreign agents” and imposes and substantially increases liability for any forms of protest. If the draft bill is signed by the parliamentary speaker Volodymyr Rybak and president, Viktor Yanukovych, it will set Ukraine’s democracy back by years. 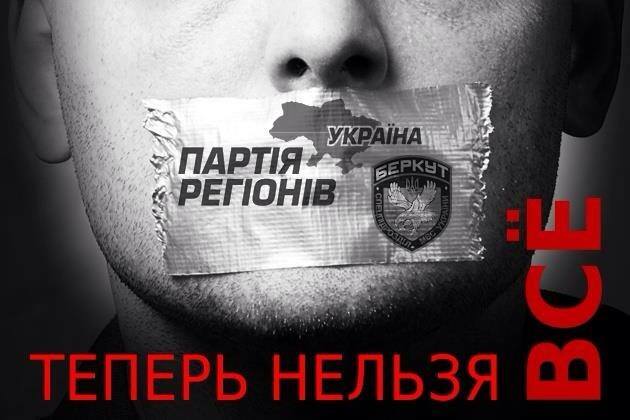 Today the Verkhovna Rada [Parliament] majority adopted a law which basically introduces censorship on the Internet. Social media denounced by the explanatory note to the controversial draft law adopted by the Ukrainian parliament. The authors insist social media are used as a tool to spread these ideas and fuel hostility, where calls to violently change power and constitution are becoming more and more frequent. The parliament also voted on the year's state budget on the same day. The budget has been highly controversial with the opposition criticizing [uk] it for multiple flaws, including a drastic increase in funding for law enforcement agencies at the expense of such items as healthcare. Opposition MPs had pledged to block parliament and prevent voting at all costs. At first, things seemed to progress according to their plan. However, the opposition quickly lost control, with the pro-government majority voting in support of the budget and bypassing regular voting procedure. And…#Ukraine‘s parliament passes 2014 budget. No discussions, debates. A quick & dirty vote, & that was that. Regions Party has the power. A brawl during the parliament session followed, with the opposition physically trying to prevent their rivals from using the electronic voting system. However, the pro-presidential majority quickly retreated and continued voting by a raise of hands. 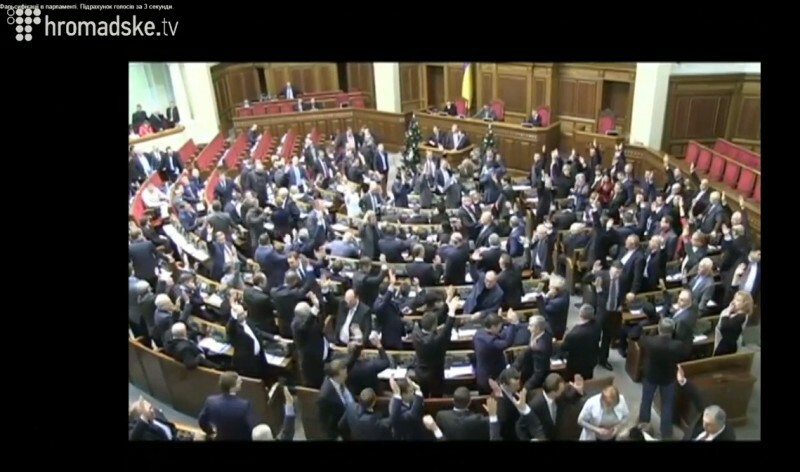 A screenshot of the live broadcast from the Ukrainian parliament. The pro-presidential majority adopts the laws by raising hands. January 16, 2014. Later, President Viktor Yanukovych signed all five laws, including the openly anti-protest law no. 3879, sparking outrage in the Ukrainian online community. Yet many other social media users have ridiculed the new measures, pointing out their absurdity. Civic movement “Chesno” depicting an activity technically illegal under new legislation. Photo by Hanna Hrabarska. Used with permission. 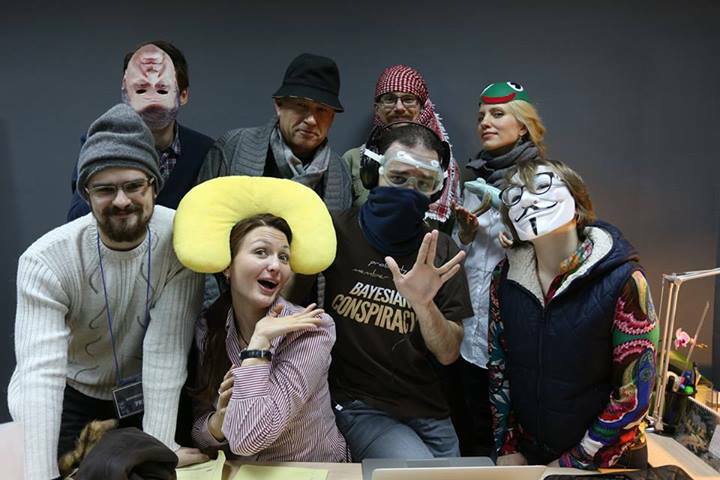 In the meantime, here we are – foreign agents, office of the CHESNO movement, a group of more than five, wearing MASKS! This post is part of our Special Coverage Ukraine's #Euromaidan Protests. Tetyana Bohdanova (listed as the author) and Tetyana Lokot co-authored this post.